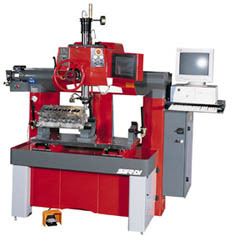 The SERDI 6.0 is an automatic machine with learning program for spindle downfeed and workhead positioning. The work head of the SERDI 6.0 is also under numerical control, allowing automatic movement from one seat to another, giving a complete machining cycle for a given type of seat. It features the most advanced technology for machining of valve seats and valve guides. The SERDI 6.0 enables the operator to take his time for preparation and control tasks during the machining process. For all types of cylinder heads from the smallest multi-valves heads up to heavy duty Diesel heads.